A photograph with a controversial caption has been circulating on Facebook since yesterday, attracting the ire of many Singaporeans of all races. The photograph (see on the left) shows a school bus with young children inside. 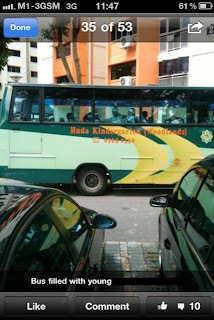 The bus services students from the Huda Kindergarten in Woodlands, Singapore. One can see clearly the attire worn by the little boys - a white shirt and a songkok (Muslim hat). These little children are clearly Muslims. And for those who are not aware, Huda is a Muslim-run kindergarten. The caption below the photograph (part of it has been blurred in this version of the photograph) states "Bus filled with young terrorist trainees?". This caption has been attributed to a Jason Neo, a member of the Youth People's Action Party (YPAP). Clearly, the caption to the photograph is hate speech targeted at Muslims in Singapore. Many Singaporeans on Facebook have been quick (to their credit) to denounce the inflammatory caption. Several have also called for the Singapore Internal Security Department (ISD) to investigate the matter; in what I can only call a knee-jerk reaction. Each time, a racial incident rears its ugly head in Singapore, invariably the ISD is foremost in the minds of people. More so today, as the ISD and the Internal Security Act (ISA) have been debated in the Singapore only a month ago. "The ISA has been used, for instance, against foreign subversion and espionage as well as racial agitation. Between 1991 and 2010, there were a total of seven cases of detentions for espionage. One case was subsequently charged under the Official Secrets Act. Wherever possible we have prosecuted espionage cases in court, but this is not always practicable when the danger from compromising confidentiality of the intelligence involved outweighs any advantage from open prosecution and conviction". Hate speech (the general definition of hate speech is: any communication that disparages a person or a group on the basis of some characteristic such as race, color, ethnicity, gender, sexual orientation, nationality, religion, or other characteristic) is regulated by various legislation in Singapore, other than the ISA. The ISA, as a means, to deal with racial agitators in Singapore is unnecessary. Singaporeans need to avoid this knee-jerk reaction to invoke the ISD/ISA, given the host of available legislation to deal with hate speech. In 2010, a Christian pastor was called up by the ISD for posting Youtube videos deriding the Buddhist and Taoist faiths. He subsequently apologized and was let off with a reprimand from the ISD. But in that particular case, the Maintenance of Religious Harmony Act could have been a route that police could have used. (d) exciting disaffection against the President or the Government while, or under the guise of, propagating or practising any religious belief. In 2005, animal shelter worker Benjamin Koh Song Huat, 27, was jailed for one month while Nicholas Lim Yew, an unemployed 25-year-old, was sentenced to a nominal prison term of one day and fined the maximum $S5000 ($A3924) for racist comments against the Malay community. Both were convicted under the Sedition Act. It remains to be seen how and under which legislation Jason Neo will be investigated for his hate speech. Jason Neo being a YP member should have known better than to spout nonsense online. He should be subjected to the full force of the law. Read more about it here. The ISA, as a means, to deal with racial agitators in Singapore is unnecessary.